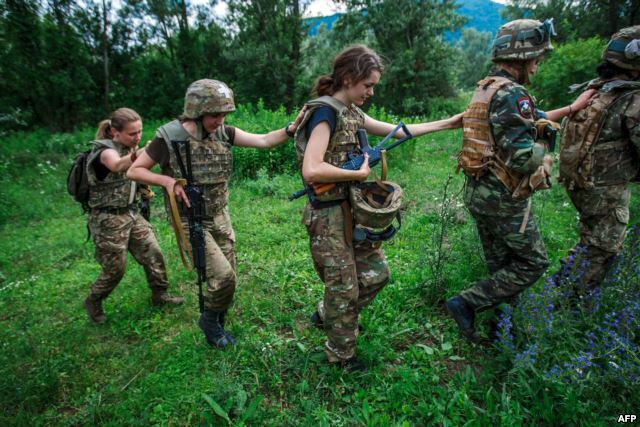 The first sociological study on women’s participation in the Donbas war – metaphorically named the “Invisible Battalion” (as women’s experience in the Ukrainian army is largely invisible to the public and legislation) – was presented in Kyiv. Female soldiers are not allowed to hold certain important positions in the army; they work in worse conditions and must constantly refute stereotype images. The authors of the study are convinced that women fight much better than some male generals, who tend to set up obstacles for women soldiers and volunteers. The study was based on 50 interviews with men and women who have served in the combat zone. A separate section is devoted to women’s participation in Euromaidan and the Women’s Sotnya (Hundred) as shortly after the revolution many female activists set off to the eastern front. Sociologists first explained the motivation that drives these female volunteers. They joined the fight for patriotic reasons and plan to remain until the end of the war. These women are usually much more motivated than men as they must overcome many stereotypes, prove their right to fight along with men and accept the fact that they cannot count on social protection. 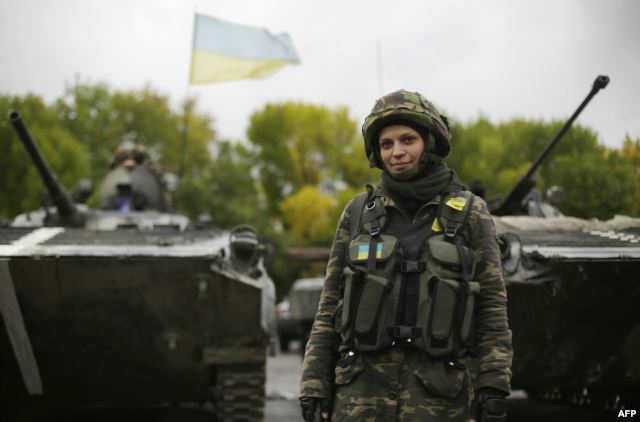 Ukrainian legislation lists professions that are not open to females. In the military, women cannot be reconnaissance scouts, snipers, drivers, photographers, projectionists, instructors or translators. Mariya Berlinska, research coordinator and director of the Aerial Reconnaissance Centre states that all positions with the title “chief” or “commander” are not available to women. These rules are spelled out in two documents: “Provisional list of positions of ordinary sergeants and petty officers” dated May 2014 and “Order of the Minister of Defense on officer positions, to which women under contract may be appointed”. Women often perform the same duties as men, but are not registered anywhere and officially hold other positions. Accordingly, they are not entitled to certain benefits and social coverage. This situation was not known before the war. Some people were aware of Nadiya Savchenko who demonstrated before the Ministry of Defense to meet with the minister and get permission to study and work as a pilot. “But that was before the war. It’s another story now. Many women have been to the front, were wounded and suffered concussions… and yet, they’re still called “cooks.” remarks Berlinska. The study has revealed a number of problems, which sociologists say are not usually mentioned in the media. For example: no suitable military uniforms for women, lack of proper gynecological care, post-traumatic syndrome and reintegration problems. Several women told researchers that social services had tried to take away their children while they were in the combat zone. When asked whether the army would become more effective thanks to female participation, most respondents answered in the affirmative. Women often make better snipers and doctors thanks to finer and more developed motor skills. In addition, they are more disciplined and less prone to alcoholism. Some men who answered this question admit that there are positive examples of women’s participation in hostilities, but they still believe that war is not for women. Stereotypes are common among women themselves: many of them think that they carry out minor duties compared to those assigned to men. Sociologist and researcher Tamara Martsenyuk is convinced that in modern society, women should have the right to choose whether they want to cook borshch or die on the barricades. “Our government’s paternalism is rather outdated. Many international documents declare that the role of women is slowly changing – not only are they viewed as victims of conflict, but as representatives in conflict resolution, together with men.” she stated. Tamara Martsenyuk says that the reason for banning women from high-ranking positions stems from the fact that the armed forces are part of the labour market. Therefore, women’s rights should be determined as part of labour legislation. Specific rules on women’s labour dates back to the Soviet era… for example, women are not allowed to lift heavy objects or drive certain vehicles. 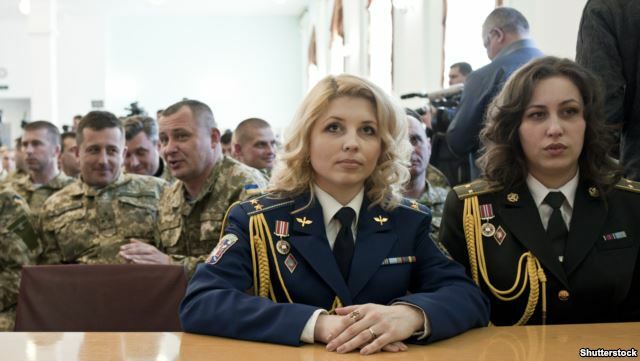 Colonel Vitaliy Holota, head of the military social division of the Personnel Department with the Armed Forces explains that women cannot occupy senior positions because they have fewer opportunities to train in specialized military fields. He adds that many proposals to expand the Armed Forces have been rejected by the Ministry of Social Affairs. 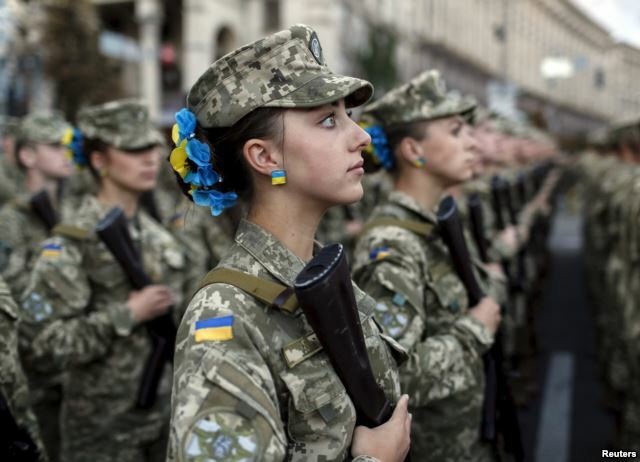 There are currently 14,500 women serving in the army, almost 2,000 of them are officers, and 35 hold senior positions in the Ministry of Defence, the General Staff, and the different types of Armed Forces of Ukraine. 938 women are listed as active soldiers.